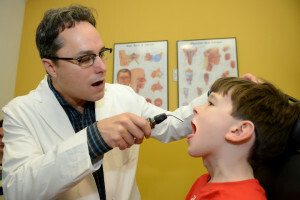 Is Your Child Suffering from Sleep Apnea? Sleeping disorders, such as insomnia or sleep apnea, are commonly associated with adults, resulting in a variety of health concerns including stress, weight gain, hypertension, and excessive fatigue. However, young children can also suffer from similar sleep issues that interfere with their health and development. One of the most common sleep disorders that affects children is known as pediatric obstructive sleep apnea, which can cause difficulty breathing, disruptive sleep, and even attention deficit disorder (ADD). If your child is having trouble sleeping and you suspect that he or she is suffering from difficulty breathing, do not hesitate to schedule an appointment with the Pediatric ENT Associates for a comprehensive evaluation and accurate treatment. According to the American Sleep Apnea Association, only about one to four percent of children who are between the ages of two and eight are affected by sleep apnea. If you suspect your son or daughter is affected by this sleep disorder, it is strongly suggested that you seek an evaluation. In some cases, children can grow out of obstructive sleep apnea, but if left untreated, the disorder can interfere with his or her development and overall quality of life. In order to help your child get a good night’s rest, medical treatment may be necessary to correct obstructions that may be contributing to sleep apnea, such as a deviated septum in the nose or enlarged/swollen tonsils or adenoids (patch of protective tissue at the back of the nasal cavity). If conservative treatments do not help, the obstruction may be corrected through surgery. A deviated septum in the nose can be re-aligned in a procedure known as a septoplasty, where are enlarged tonsils or adenoids may be removed during a tonsillectomy or adenotonsillectomy. Contact a Pediatrician at Children’s of Alabama Today! If your child is suffering from a sleep disorder, contact Pediatric ENT Associates at the Children’s Hospital of Alabama at (205) 831-0101 to schedule a consultation today!